Bacon, Beans and Camping – What A Combination! 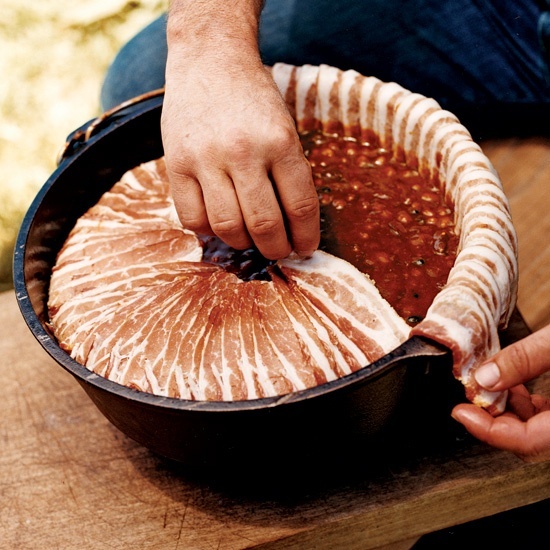 I’m always looking for new ideas around the campsite, and this looks like an awesome way to cook your favorite camp style BBQ Baked Bean recipe. Plus, look at all that BACON, BACON, BACON!!! That’s a whole lot of bacon! “Baked BBQ Beans “… Love the presentation … beautiful ! *Only one word of caution, make sure your tent is well ventilated in the night! Let us know if you try this, leave a comment below. This entry was posted in Year Zero Survival Blog and tagged bacon, bar-b-que, BBQ, beans, campfire, campfire cooking, campfire recipes, camping, camping food ideas, camping recipe, hiking, outdoors, recipes by staff-writer. Bookmark the permalink. There’s a YouTube video on how to make these. Is put some coals on to as well and/or partially precook my bacon. so I’m not the only one who couldn’t find it! There’s a link to the recipe book, It was published and do not want to take away from the author. Kind of hate websites that mislead you. I was looking forward to seeing this recipe and nothing. I guess I’ll avoid these posts from now on. Thanks for nothing but wasting my time. Love to try to bad the recipe doesn’t show….